You may have already heard a few appalling facts about food waste but just in case you haven't, here are a few tidbits of information to catch you up on the issue. -We throw away 165 billion dollars worth of food per year in America. That's more than the budgets for America's national parks, public libraries, federal prisons, veteran's health care, the FBI, and the FDA combined. This weekend I arrived in New York City from my second bike ride across America living on food from grocery store dumpsters. On my first ride dumpster diving across America, about 70% of my diet came from dumpsters, totaling up to about 280 pounds of food over 4,700 miles of cycling. I'm not just dining from the dumpster to meet my needs though. 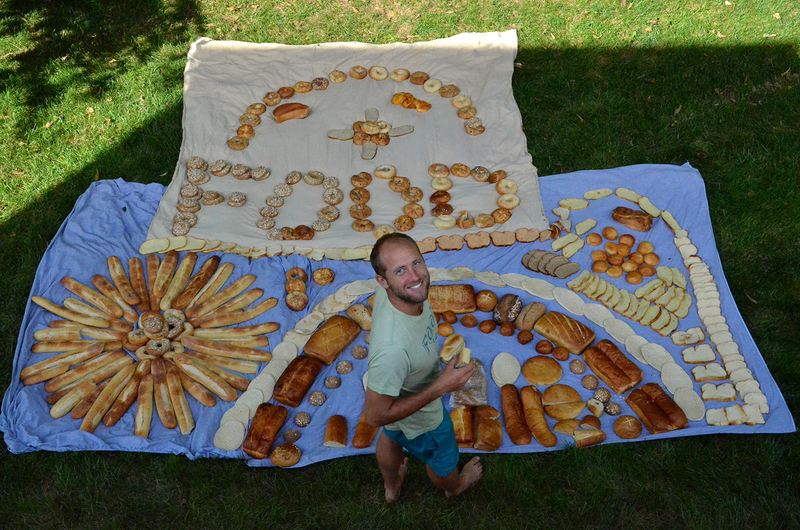 I'm doing this to inspire America to stop throwing away food. My interactions with whomever I crossed paths with helped them to see the food waste fiasco firsthand but still I said I would help YOU see it to believe it. That is where photos from my public demonstrations come into play. In seven cities along the tour I went out dumpster diving, usually just for one night, and set up my find in a public park the next day. Many people were shocked by what I showed them and even more were angry, not at me, but at the waste of our society when millions of Americans are hungry. I've learned that I can roll up in nearly any city across America and collect enough food to feed 100's of people in a matter of one night. The only thing that limited me was the size of the vehicle I had to transport it. My experience shows me that grocery store dumpsters are being filled to the brim with perfectly good food every day in nearly every city across America, all while children at school are too hungry to concentrate on their studies. My intentions with these photos are to help you to get an idea of the scale of this issue. Even still these are just photos. Seeing it in person is a whole different story. So my mission continues. If you are in New York I invite you to join me in person this Tuesday, September 30th, in Union Square Park for the final fiasco of the tour. I'll have been out diving in the area for the weekend and you'll be able to see first hand what America is throwing away. The food will be set up for display by 5:00 PM and after a few hours of viewing it will be free for the taking. I know not all of you are in New York though and I also want YOU to see it for yourself. So I encourage you to go to your grocery store and do something a little different from your normal routine. I want you to walk around to the back of the store, find their dumpster, and take a look inside. You don't have to take any of the food home with you. You don't have to get in the dumpster either. Just take a peak and see this problem for yourself. The dumpster may be locked or it may have just been emptied so check out a few places if needed. 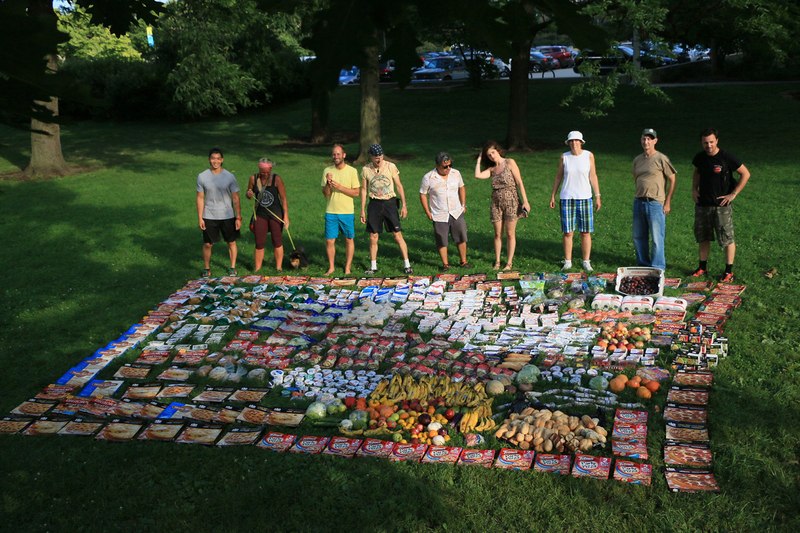 The first time you see a dumpster full of food your life could be changed forever. If you feel inclined to be a part of the solution I encourage you to photograph or video the wasted food you find and spread it on social media using #DonateNotDump. Tweet it at the store and let them know that we are not going to stand for their waste anymore. With that action in mind you should be versed in this a little bit more before you hit the dumpsters. Our message to the grocery stores is that we want them to stop dumping their excess food and start donating it to non-profits so it can be distributed to people in need. Through my hands on experience and research I have found that it is a win-win situation for grocery stores to do this. They are protected from lawsuits by the Good Samaritan Food Act, they get tax write offs, they spend less on dumpster fees, and most importantly they are doing what is right for their community when they donate their excess food! The most common excuse for not donating is that they fear liability but they are protected and according to a University of Arkansas study not a single lawsuit has ever been made against a grocery store that has donated food to a food rescue program. Thousands of food rescue programs, such as City Harvest, Feeding America, and The Food Recovery Network are already feeding people across America and thousands of stores are already donating to these non-profits and food banks. However it is a very small fraction of what could be done. We need more stores donating more often and we need them to compost what they can't donate rather than sending it off to the landfill. You don't even have to peak into their dumpsters if you don't want to. Share this article with supermarkets or simply talk to the manager while you are at the store and let them know that it is important to you, their customers. Humans with hearts run these stores and we can get them to change for the better! It's up to us to hold them accountable to treat the environment and our hungry Americans with the respect they deserve.